One analyst thinks Ciena may be stealing away one of Infinera’s biggest customers. Optical transport systems help speed up data transmission over a fiberoptic network. Since there are huge tailwinds for data processing and transport, especially with 5G communications on the horizon, one would think the optical industry would be booming. However, a recent slowdown in optical spending by U.S. telecoms over the past few years has caused a great deal of distress in the industry. And so, over the past year the optical systems industry has split into two camps: the strong and the weak. In this difficult environment, the larger, more globally diversified firms have been able to survive and remain profitable through the downturn, while smaller, less profitable vendors have struggled. For a great example, look no further than the recent note from MKM analyst Michael Genovese. 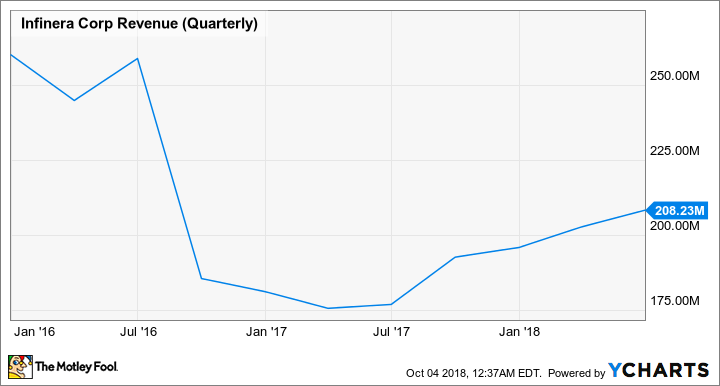 Genovese anticipates large systems vendor Ciena (NYSE:CIEN) may end up stealing away large customer CenturyLink (NYSE:CTL) from smaller competitor Infinera (NASDAQ:INFN). That could be a huge win for Ciena and a huge blow to Infinera, and the episode is emblematic of this period in the industry. According to Genovese, his channel checks revealed that CenturyLink is "likely to switch because of concerns with Infinera's ability to produce new leading edge DSPs (digital signal processors) every 18 to 30 months." Genovese actually gave a 90% probability that CenturyLink switches vendors. In response to the MKM note, Infinera came out with a statement saying that after conferring with a CenturyLink executive, a decision had not yet been made on the optical contract. Should CenturyLink opt for Ciena or another vendor, it would be really bad news for Infinera. In 2017, CenturyLink accounted for 18% of Infinera's sales, with no other customer accounting for more than 10% of the company's business. Infinera's customer concentration risk went up when CenturyLink merged with Level 3 Communications last year. Level 3 was previously Infinera's second-largest customer, so when the two merged Infinera became very exposed to CenturyLink's internal decision-making. This doesn't seem to be merely a case of Ciena offering a huge discount to try to lure away a huge customer (although there may have been some of that). Because each successive generation of equipment requires significant research and development expenses, Genovese thinks CenturyLink is wary of Infinera being limited in its ability to invest through the cycle, or at least enough to meet the innovation requirements of CenturyLink's enterprise-focused global network. 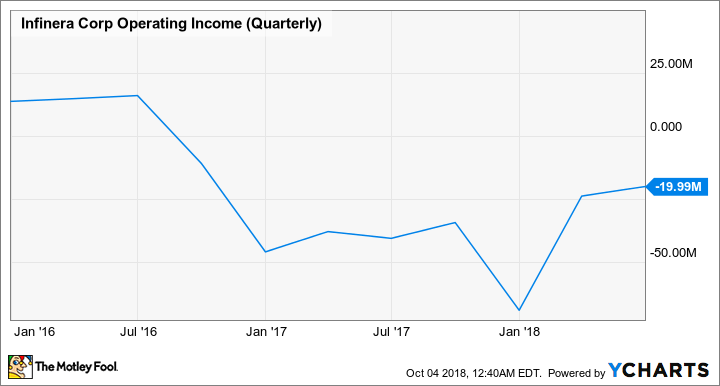 In its recent quarter, Infinera claimed it had secured new customer deployments and said that it should grow this quarter; but since new deployments are lower-margin, management still projects non-GAAP operating margins of negative 3%. Infinera's lack of profitability stands in stark contrast to Ciena, which just posted a great quarter. Ciena is benefiting from its larger scale and growth in key international markets such as India, where it's a leader, and Japan, which has opened its doors to non-Japanese optical vendors. Ciena's Wavelogic products are catching on big with cloud companies as well, as cloud revenue surged to 20% of the company's overall revenue. The cloud surge has added a nice diversification to Ciena's core telecom customer base. This investment capacity has enabled Ciena to introduce a 400 gigabyte-per-second offering before its competitors, leapfrogging to the top of the industry. It should be noted that CenturyLink has not decided on its vendor as of this writing, and Infinera is taking dramatic actions to attempt to boost its scale. Most notably, the company just closed its $430 million acquisition of Coriant, a privately held optical network provider, in a transaction that will approximately double the company's revenues. If Infinera can successfully integrate Coriant and retain CenturyLink, then today's depressed stock price could turn out to be a bargain. But that's a risky proposition. 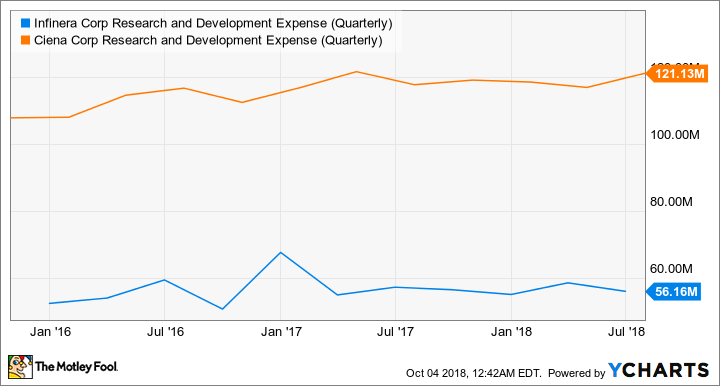 With Ciena now performing incredibly well and on much more stable financial footing, it's hard to bet on Infinera instead of the current market leader. In the course of the optical networking industry's current consolidation, the strong are getting stronger, so I'd opt for the stronger company. That means Ciena.